The Audio industry is undergoing a profound evolution and Flux:: Spat Revolution is here to tackle it. Total immersion is the future of the gaming and entertainment industries. Augmented reality is no longer an abstract notion, it is now dramatically affecting how we work, play, travel, and communicate, as data is being converted to construct a totally immersive environment. SPAT Revolution is The software solution for meeting the challenge of real-time 3D-Audio mixing and post-production today. It provides a complete toolset for sound design, audio for VR-engines, movie/cinema audio mixing, live and installation sound (theaters, live performances, museums etc). It provides a complete toolset for artists, sound-designers and sound-engineers allowing total control of the position of audio-sources in a three-dimensional environment, adding further spacial effects, and finally sending the result to any loudspeaker setup or just a pair of normal stereophonic headphones. SPAT Revolution was created for audio professionals and designed to easily integrate into any workflow. With features such as its flexible modular concept, a unique capability to specify and automate the spatialisation parameters completely independent of the output format, support for different types of both hardware and software inputs/outputs, as well as network support for both audio and automation, it offers endless possibilities while remaining simple to use and ergonomically friendly. It’s an efficient and creative working environment for the user. Its originality also lies in its way of controlling the room effect using perceptual criteria that allows the operator to intuitively specify the sound characteristics of the space he needs to create. The sound quality is of paramount importance in the SPAT Revolution. It has been built using the best algorithms from years of research at the Acoustic and Cognitive research department at the French research institute IRCAM (Institut de Recherche et Coordination Acoustique/Musique), as well as those developed by Flux :: sound and picture development over the past 10 years. A powerful and innovative framework developed by Flux :: enables it to combine optimal performance and flexible scalability as well as complete compatibility on Mac OSX and Windows (Linux version coming soon). 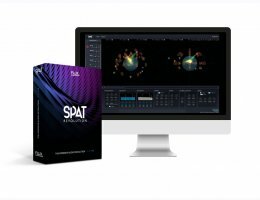 SPAT Revolution mixes, reverberates and spatialises audio material from all kinds of sources such as, microphone arrays/trees, spot microphones, Ambisonic captions at higher orders, as well as any type of pre-produced stems with any number of channels (Stereo, QUAD, 5.1, 7.1, Atmos, Auro 3D, etc). It utilizes standard hardware audio interfaces and also supports all major DAWs and their formats (AAX, AU, VST). Several 3D-spatialization techniques (VBAP, DBAP, HOA, Binaural, etc) can be combined, and it can render mixes in different formats simultaneously. It offers innovative 3D-audio signal visualization modes as well as precise signal level control. Finally, the software is fully network controllable using the Open Sound Control (OSC) protocol. Number of inputs/outputs virtually unlimited, depending on how powerful the computer running the software is, and the specifications of the audio interfaces used. Supports input/output using standard plug-ins, AAX, AU, VST, for easy integration with all major DAWs. Standard plug-ins, AAX, AU, VST, for control and automation of sources, rooms and masters (local path or over network using OSC). Unlimited number of sources (mono, multichannel, Ambisonic microphones, etc). Sample rates up to 384 KHz supported. Multiple stream formats supported: Channel-Based (C.B), Higher-Order Ambisonic (HOA), A-Format, B-Format, UHJ, Mid-Side (MS), Binaural, Transaural. Unlimited number of spatialization buses supported (VBAP 2-D and 3-D, HOA 2-D and 3-Binaural, Stereo, etc). Binaural rendering for headphones (with compensation for nearfield effects) and Transaural rendering for loudspeakers. Vector-based amplitude panning (VBAP 2D & 3D). Distance-based amplitude panning (DBAP 2D & 3D). Vector-based intensity panning (VBIP 2D & 3D). Speaker-placement correction amplitude panning (SPCAP). B-format and Higher Order Ambisonics (HOA), Encoding/Decoding up to 7th order, Integrating different decoding methods (Projection, Pseudo-Inverse, Energy-Preserving, AllRAD). Input/Output Transcoders (C.B (Channel Based) to C.B ; Channel splitter aggregator, HOA to HOA for conversion of normalisation and channel-arrangement, HOA to C.B, A-Format to C.B, MS to C.B, etc). Loudspeaker configuration editor with presets for the current industry formats (Stereo, QUAD, 5.1, 7.1, CUBE, Dolby Atmos, Auro 3D, Mpeg H, Demi Shpere, NHK 22.2, etc). Time alignment and gain compensation function for loudspeakers. Artificial reverberation utilizing IRCAM’s Spatialization engine. Perceptual control of the acoustic quality of the room effect; Warmth and Brilliance, Presence/Proximity of the source, Room Presence, early and late reverberation, intimacy, vivacity. Simplified control of the source radiation (opening and orientation). Low level signal processing; Equalization, Doppler Effect, Air Absorption, etc. Unique visualization of the signal distribution in the 3D space. Flexible Input / Output / Bus Routing. Fast, Fluid and customizable graphical interface. Highly optimized rendering (low CPU consumption). Supports HRTF files in AES-69 SOFA. With Manager and connection to the IRCAM server. Python Script Supported (Currently undocumented). Multiplatform : Mac OS X, Windows. Available in AU / VST / AAX Native plug-in formats.